There are almost 700,000 overseas Filipinos workers (OFW) living in the United Arab Emirates (UAE), 450,000 of which live in Dubai comprising 21.3% of the total population of Dubai. It is the largest population of Filipinos in the UAE, followed by Abu Dhabi and Al Ain. OFWs in the UAE sent over US$500 million in remittances to the Philippines. The UAE is home to over 200 nationalities. Emirati population is only about 20% of the total population. To address illegal residency issues, the UAE government is giving amnesty to the expatriates, giving them a chance to correct their residency status before the anticipated crackdown on illegal residents. 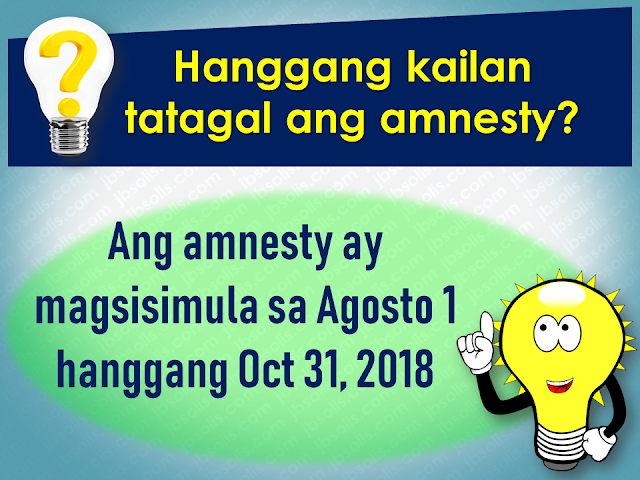 The amnesty 3-month amnesty period will begin on August 1 until October 31 this year. Embassies and various consulates representing the expatriates are also expected to coordinate with its nationals during the amnesty period. 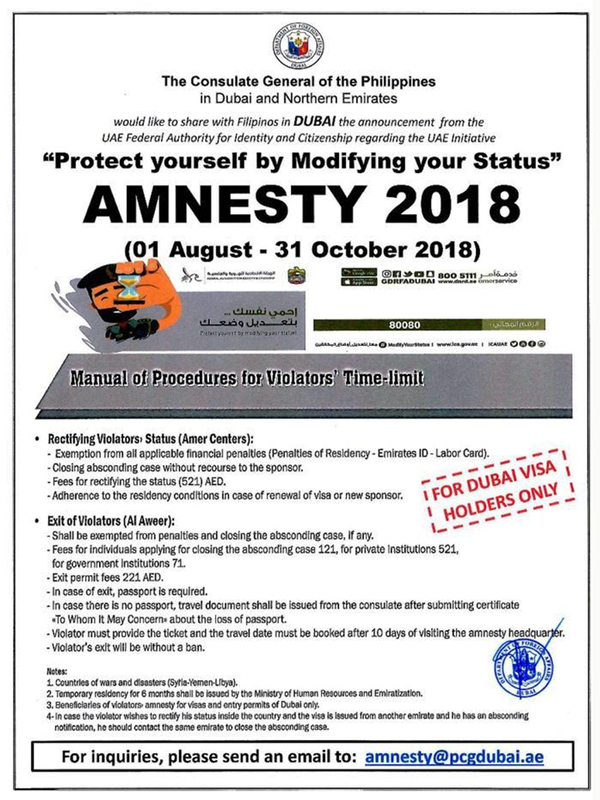 Expatriates who are staying illegally in the UAE are encouraged to apply for the amnesty. For more information and guidance about what the amnesty is all about and how to avail of it, please check out these useful questions and answers concerning the amnesty to be given to the expats who have issues with their residency in the Gulf state. 1. What is the duration of the amnesty? 2. Who are the people eligible for amnesty? The individuals who are staying illegally in the country can apply for amnesty. 3. What are the two options available for illegal residents under amnesty? Those who wish to exit the country can go back to their home countries without paying fines or facing a jail term. Or individuals can regularise their status by getting a new visa under a sponsor. 4. Will those who entered the country illegally be given amnesty? Yes. But they will exit the country with a two-year ban. 5. Will there be a permanent ban on reentering the UAE for those who avail of amnesty? No. There will be no ban, and people can re-enter the country on valid visas. 6. Will the applicant have to pay to overstay fines before modifying their illegal status? No. Applicants of amnesty will get a waiver on all overstaying fines. 7. What kind of violations will not fall under the amnesty scheme? People who have been blacklisted and also those who have legal cases against them are not eligible for amnesty. All residency violations will fall under the amnesty scheme. 8. Can those who have an absconding report against them apply for amnesty? Yes, Immigration authorities will remove the absconding report and issue exit permit without a ban. 9. Can applicants who modify their status apply for jobs in the UAE? 10. How long can those who modified their residency status stay in the country to look for jobs? A: People looking for jobs can obtain a six-month temporary visa to look for employment. 11. How can residents apply for amnesty? A: Illegal residents wishing to exit the country can approach the Immigration department and get an exit permit. 12. What are the documents residents need to submit? A: Residents need to submit the original passport or EC (emergency certificate). They also need to submit an air ticket along with the application. 13. What is the fee for applying for exit permit? A: A fee of AED220 is charged on the exit permit. 14. What is the fee for modifying residency status? A: A fee of AED500 is charged. 15. Can residents without passports apply for amnesty? A: Yes, Residents without passports can also apply. 16. What is the time period to exit the country after getting the exit pass? A: Individuals have to exit within 10 days of getting the exit pass. 17. How can those who cannot come to the Immigration apply for amnesty? A: Immigration will issue exit permits based on medical reports or letter from the embassy or consulate. 18. How many amnesty service centers have authorities established across the UAE? A: A total of nine centers have been established at the centers of the General Directorates of Residency and Foreign Affairs across the UAE. 19. Where are the centers in Abu Dhabi located? 20. Where can people submit their documents in Dubai? 21. What is the location for other emirates? 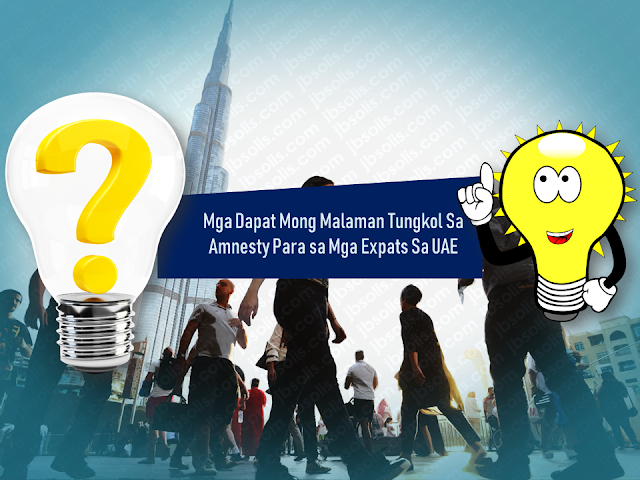 A: The amnesty centers are located at the Immigration Offices in the emirates. 22. What are the timings for the centers? A: The amnesty service centers will open from 8am to 8pm. Families coming from war-torn countries like Syria and Yemen will be granted a one-year residence visa without restrictions attached. Meanwhile, a social media post from the Philippine Embassy in the UAE said that for the OFWs who wish to be repatriated to the Philippines, the Philippine government will shoulder their one-way plane ticket and other fees. However, the embassy clarifies that it is only applied to only those who are willing to go back home.